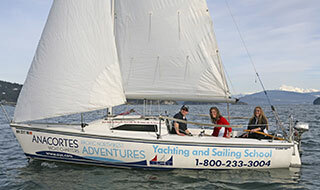 Anacortes Yacht Charters has a full range of instruction available to put you at the helm of your own bareboat - even if you are just getting started. RPBA courses offer both depth and breadth. The Association's foundation course, "Close Quarters Powerboat Handling," offered as three separate classes based on different powerboat types, assures that students receive the practical training specific for the craft they intend to operate - not practice on a boat likely to be vastly different than the one they will be handling. 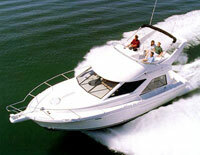 This training program is offered on a 32' to 36' twin engine power boat. A Home Study package is sent well in advance for your preparation. The package incudes a textbook, a sample chart with nautical symbols & abbreviations, a tide table and an anchoring primer. 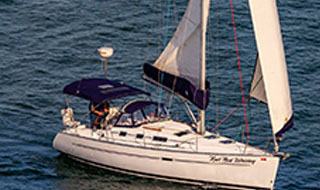 This 3 day / 2 night class provides "on the water" training. Instruction begins at 1:00 PM Friday afternoon with a complete review of terms and concepts. It progresses to "hands on" skill building while focusing on close quarter maneuvering, docking, anchoring, and practical navigation. Expect intensive training as our floating classroom cruises the islands. Your new skills and knowlege should provide you with sufficient experience to safely and comfortably skipper a similar vessel. This program includes the same training as Introduction to Power Cruising, but is offered on a mid 34'-36' single engine power boat. Great class for those transitioning from sail to power. Work as a team to master boat handling, docking, anchoring, mooring and practical navigation in this three day class taught on 32' to 36' vessels. In addition, emphasis will be placed on procedures for the 1st Mate to follow in case of an emergency situation, to include VHF radio usage & Coast Guard radio protocol as well as Man-Overboard procedures. This course includes the same valuable training as our Introduction to Power Cruising while also introducing the student to basic operation of modern navigational aids and auxiliary power sources. Additional time is also spent on crew training and dock maneuvering. 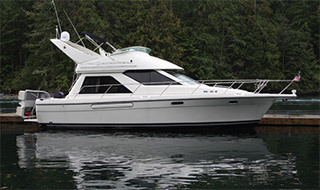 Training is offered on 45' to 47' power yachts. Previous power boat experience is required. 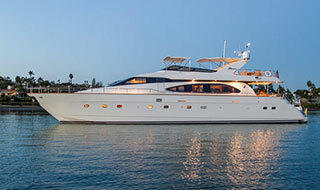 The yacht serves as both the training platform and overnight accommodations. Linen or sleeping bags & towels are included. Breakfast, lunch and snacks are provided. Dinners are on your own. Students should plan to bring comfortable clothing, including suitable deck shoes and a waterproof jacket. You might want to bring quarters for the shower facilities on shore. Group Class Schedule: Bring a group of 3 or more students and we will make every effort to schedule class dates to meet your needs. Contact one of our friendly Charter Agents for details. Graduates Enjoy Special Benefits: After you have completed any of our Power Yachting Courses or ASA Classes, you will immediately become a member of our Captain's Club and gain special discounts on AYC charters as well as other great benefits. Cancellation Policy: We will be unable to offer refunds for any reason if cancellations occur within 45 days prior to the class. For cancellations outside 45 days, 50% of the total amount will be forfeited. AYC reserves the right to cancel or change a class due to minimum enrollment requirements. Prices subject to change without notice.